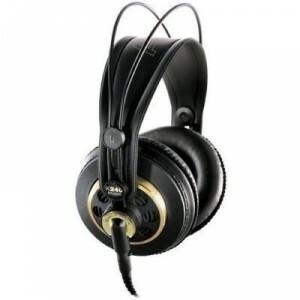 AKG also manufactures a range of high-specification headphones. 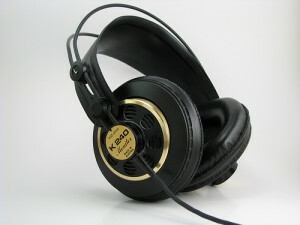 The K50 model, introduced in 1959 were the world’s first supra-aural and open-back headphones. The K1000 was the flagship model, but is no longer being produced. It was an open back dynamic headphone. 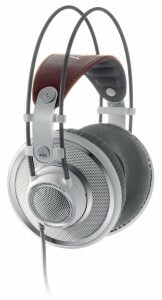 The current flagship models for the AKG headphone line-up are the K701/K702/Q701, which are nearly identical. The K702 features a removable cord and is black, the K701 is white. 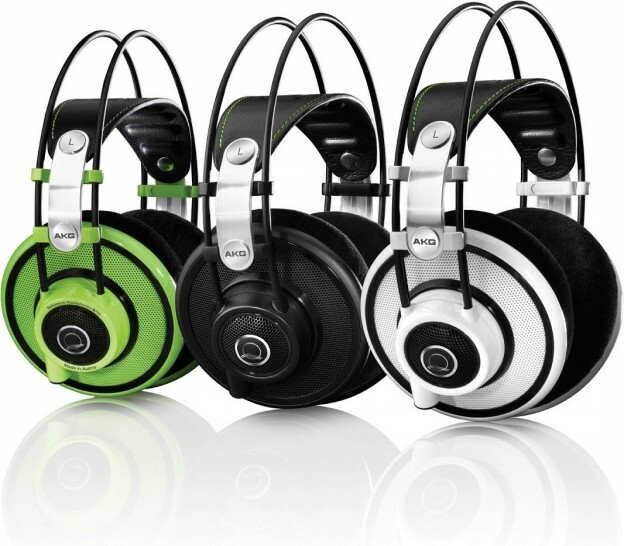 The Q701 also has a detachable cable and comes in three color variants: white, black, and a lime green. All three models are still in production. The K701s have been largely used by professional musicians and technicians in recording studios. Many top recording studios use AKG K240 headphones as a solution for best general use for both monitor and playback. They received particular notoriety from their prominent display in Eddie Murphy’s 1985 music video for “Party All the Time” (which features the K240 Monitor). 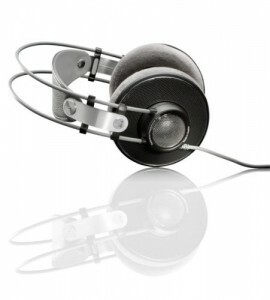 Another notable, yet short-lived model was the K280 Parabolic – a multi-driver headphone which focused compression waves to a central point in the earcup. The K845 BT offers AKGs reference sound quality in a sleek wireless package, providing instant connectivity via NFC to a wide range of Bluetooth enabled smartphones and other portable devices.The ear cups luxuriously cushioned to enable comfortable long-listening sessions and feature acoustic dampening which further extends bass response from the two 50mm (2 inch) drivers. 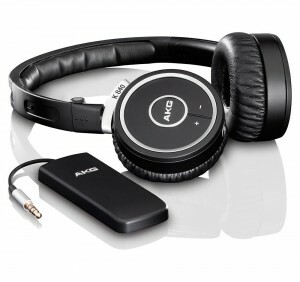 Controls are conveniently located on the ear cups, while a cable is also provided for wired connection to other devices that arent Bluetooth enabled.The AKG K845 BT headphones are powered by a Lithium battery which provides up to 8-hours wireless music enjoyment and is charged via a mini USB to USB charging cable so youll never be out of juice. Specially-selected 50mm drivers and a closed-back design works together to deliver precision sound with superior acoustic dampening and enhanced bass response. NFC connectivity allows you to get in touch with other Bluetooth-enabled devices including most smartphones in an instant.Ease of useControl buttons conveniently located on the ear-cup allow you to command your sound effortlessly. With 50mm drivers and a closed-back design, these AKG K545 K545BLK over-the-ear headphones deliver powerful audio with enhanced bass response and acoustic dampening. Two 3.9′ cables with in-line remotes and microphones enable flexible connectivity. There are houses, and then there are mansions; there are cars, and then there are Bentleys, There are headphones, and then there are AKG K 701s — get the idea? AKG K 701s aren’t for everybody, only people who demand the best performance from their phones and absolutely will not compromise on sound quality. If that’s you, then prepare to be throughly satisfied. From the first time you feel their luxurious 3D-Form ear pads and self-adjusting cushioned leather headband, you’ll be throughly impressed by the exquisite craftsmanship and appreciable build quality. And that’s before you plug them in. The K702’s are reference, open, over-ear studio headphones for precision listening, mixing and mastering. They combine an extremely accurate response with agility and spaciousness. This is achieved by using revolutionary flat-wire voice coils and a patented Varimotion two-layer diaphragm. A totally open design and a high-performance cable complete these reference headphones. 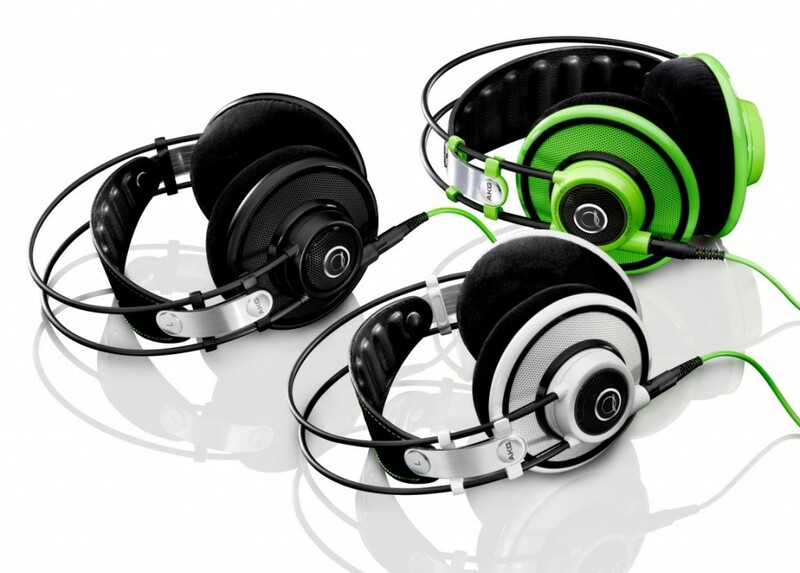 The K702’s comfortable, specially shaped 3D-foam ear pads and a padded genuine-leather headband ensure a perfect fit. They provide a professional mini XLR connector for quick replacement of the cable. The K702s are individually tested and serial-numbered. The K 550s deliver excellent sound quality, with a 50mm driver, the largest AKG offers in its headphone line. Thanks to their closed-back design, true AKG sound can be enjoyed without disturbing others. The K 550s’ large ear cups and newly designed headband offer an amazingly comfortable fit. 2D-axis folding mechanism for easy storage at home. A reference class headphone at an attractive price. The newly designed AKG K551 headphones are optimized for a fully immersive listening experience and for comfort. Starting with a 2-inch (50-millimeter) driver on each ear, these reference-class headsets use Real Image Engineering to create a highly realistic sound environment with a true sense of dimensional space. Lightweight, with a comfortable fit, AKG K551 headphones have incredible passive noise reduction and extremely low sound leakage levels that will keep you living blissfully inside your sound environment for hours on end. “Precisely tailored response and cutting-edge design: a must for all audiophiles. These future-oriented, open-back dynamic headphones do not only offer good wearing comfort but also deliver an incredibly detailed, full, yet crisp sound. The AKG Q701 reference-class premium headphones represent a momentous partnership with AKG and one of the most accomplished musicians of the 20th century: Quincy Jones, an American icon whose productions include the best-selling album (Thriller) and single (“We Are the World”) of all time. Quincy has received an unprecedented 79 GRAMMY nominations and 27 GRAMMY awards, more than any other living artist. It stands to reason that the headphones he puts his name to must be nothing but the very best, and the Q701s are the most accurate and responsive headphones AKG has ever produced. Reference denotes a class of audio equipment that imparts little to no change to the input audio signal, producing a huge, airy, three-dimensional sound. AKG K391 NC in-ear headphones turn a noisy space into a private concert or screening. Compact and easy to travel with, these noise-cancelling, in-ear headphones will make anything from a crowded airplane to a subway seem downright peaceful while delivering powerful, detailed sound directly to your ears. We’ve included a premium carrying bag, and an in-line microphone allows you to answer calls. 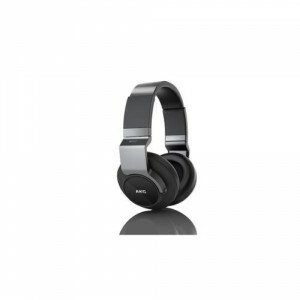 K 840 KL headphones use advanced Kleer® wireless technology to stream lossless, CD-quality audio over the air from your iPod, iPhone or other portable music player. Unlike wireless technologies that degrade the sound, the Kleer system delivers pure, uncompressed 16-bit stereo audio over a robust 2.4GHz radio link, so you’ll hear much more of your music with much less interference.And with an operating range of more than 20m and battery life of up to two weeks in normal use, the K 840 KLs go farther and play longer than any of their wireless competitors. Audiophiles are always sticklers for awesome sound quality. Often, you’ll find them with two or even three different pairs of headphones or earphones. Each of those pieces offer a different kind of experience for different kinds of platforms. This is why getting an audiophile to buy different types of gear can be hard sell because each of them have different kinds of preferences when it comes to sound. As a beginner, you can’t simply ask them for advice because you’re going to come up with six different opinions which company makes the best pair. This is where subjective tastes come into play, so in the end, you might have to try out many different kind to find the one you want. Of course, there are certain companies that try their best to appeal to everyone, and if you’re still wondering just who to turn to, maybe you should be giving the AKG 701 a spin. 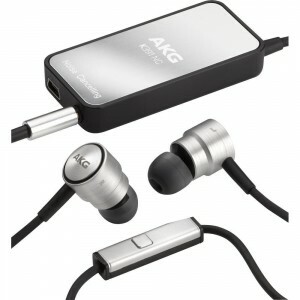 AKG is a company that is well known for a lot of things. First off, a lot of their line up features softer bass in favor of higher degrees balance and volume. The second factor you’ll need to know is that their headphones often come with a second cord that extends a little longer. In both of these respects, the AKG701 tries something new. The bass quality in these headphones is very evident and it is now brought out into the foreground. Once you play an electronic track with a bass emphasis, you’ll notice immediately it bursts clear into your head and rattles your skull a little. In fact, every other frequency is also emphasized with these pairs, and this is even more noticeable when you start putting on your lossless tracks. This is isn’t by accident, as the AKG701 headphones are designed to pick apart and emphasize each track you push through it. This makes every element in any song you play easy to hear and to notice, but with that in mind, the sacrifice is the balance. However, this makes the AKG701 an excellent choice for those that want to analyze every song they’ve ever heard. It’s a shame that AKG has removed the secondary cable in this package, but that’s understandable considering the default cord is long enough. Extending at around 3m, you can still enjoy all your tracks on a comfortable chair, which is reasonably distanced, from your computer. The headphones themselves provide a decent amount of noise suppression, and doesn’t leak sound at all. To top that off, they are also quite comfortable, and the adjustable rim can help you fit in the perfect direction. The pair cups your ears quite snugly, but it never applies too much pressure. Should you buy this set? While the AKG 701s don’t come cheap, the $300 price tag is really justified. You can use this pair for almost any kind of activity as the highly detailed, but picked apart, sound really makes this pair a cut above the other in its price bracket. If you’re an amateur audiophile looking for a great pair of headphones and money is no object, there’s no way you should be passing up the AKG 701s. One can expect that a pair of headphones from a relatively renowned company like AKG and sponsored by Quincy Jones would end up being some of the best on the market. The true result of this match made in audiophile heaven is awesome. The sound on almost any track cuts clear into your brain, and if you have a thing for lossless quality tracks, you’re surely going to enjoy this pair of headphones. 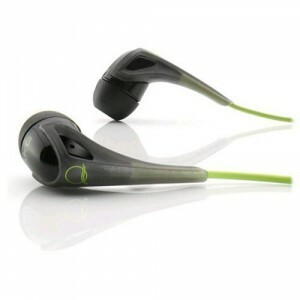 The main quality this pair of headphones aims to emphasize is clear and crisp sound delivery. Each track you push through these headphones will obviously be enhanced when you play it. At the same time, these headphones don’t do well with devices that don’t output a great quality sound. While it does try to enhance the sound, if you’re playing your tracks through an old phone, you’re not going to get your money’s worth. However, if you take the time to scan your library for different genres, be warned that the AKG 701 Quincy Jones model sort of suffers when it comes to bass. It basically means electronic music mixers will find this pair lacking, but live instruments users will get a kick out of them. AKG has a nice little habit of including an extra pair of something or another in with their headphone package, and in this case, it’s a cord. The detachable feature is awesome for people that want to take these monsters along with them on trips, but if you like your listening private, then the open back plastic feature will have you reeling in fear. The secondary cord extends a tad further than the first, which is very welcome for those that like rolling around on their seats, or like to be situated in a comfortable while they listen to their music. These headphones are great and is also extremely comfortable when compared to the other pairs in this price bracket. They fit snugly, and are sort of warm, but what you get in terms of sound quality makes up for all of its failings. However, the $400 price tag will probably have you in second thought. For those that need this kind of excellent quality, that is a small price to pay for these awesome head phones. Headphones aren’t exactly breaching the mainstream market nowadays. Usually, companies that produce high quality headphones are often glossed over by bigger companies that feature devices, which are more flash. This is why it can be a competitive market when it comes to the different headphones you can purchase, but that’s a good thing because you get to choose from a large pool of devices. Of course, there are some headphones that are suited to certain jobs so the thing you really have to look out for is your need as opposed to how much over the budget you can go. The AKG K240 semi-open studio Headphones offer a lot of different qualities, but again, you have to gauge what you need out of a pair. The first thing you’re going to notice when you plug these babies in is that some part of the music you listen to become more emphasized. That underlying track you might have missed with your old pair, is suddenly out in the open, and playing with the main instruments. This is the best part about the headphones because K240 brings out features in your music. The downfall here is that the pair doesn’t do much to punch up your music. Everything sounds very balanced, but in turn, you’ll have to sacrifice volume and details on each of the songs in your library. When switching to games, you can instantly hear stuff, which is right behind you brought to the foreground. While this isn’t a negative, this sacrifice of spatial audio makes a game feel like it is lacking that surround sound element. This pair is not for people that need to mix tracks because you’re going to miss one or two qualities along the way. Upon opening the box, you’re going to notice two different pairs of two different tools. First off, you get two pairs of head pads with varying levels of softness. The pre-installed pair is a tad softer than the ones in the box, but having the opting to switch out between either is an awesome feature. The second thing is that you will also get two different pairs of cords. The one attached will be around 3m, and the second will be 5m but extends with the help of a corded section. Overall, these two different accessories justifies the $100-$130 price tag (depending on the store you’re buying them from), and will probably be beneficial in the long run. 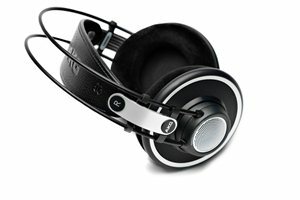 At the price of $140, you can find other headphones that do a lot more in terms of sound quality. 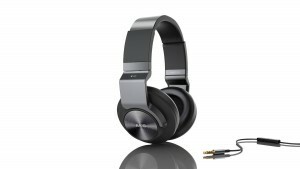 While this pair is very decent, they are a bit entry level in comparison to other headphones in the same price bracket. However, for the home body that likes a well rounded sound experience and a pair of headphones that won’t soon break, the K240 is a great choice. It features a balanced experienced, and the semi-open set allows for enough enjoyment so that you won’t end regretting the buy. Music mixers, and those that have to work with high quality, will inevitably find this set lacking. 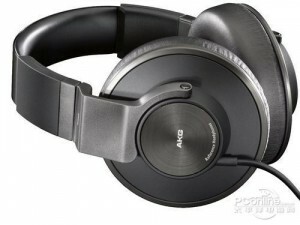 AKG is one of the top brands when it comes to headphones. 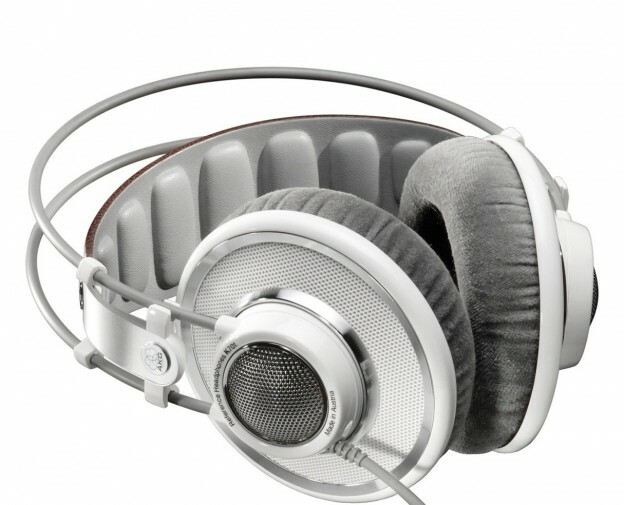 This American-owned, Austria-based manufacturer of audio electronics produces high specification headphones and is notable for introducing the world’s first supra-aural open-back headphones in 1959 called the K50. There are several professional recording studios that use AKG headphones for sound monitoring and playback. One of the company’s headphones, the K240 Monitor, prominently figured in the 1985 music video for “Party All the Time” by Eddie Murphy. If you are looking for the best headphones manufactured by AKG, consider the following list as your guide. They are ranked based on their respective overall package, taking into account their quality, sound output, and value. The AKG Q350 line of earphones features an attractive lime-based color scheme. To some, they may seem gaudy buy they certainly are easily noticeable and striking. These earphones have notable beefy base and soundstage although some may complain about the unnatural treble sound. Also, the color and build quality seem to make the headphones feel cheap. The combination of some rubber and glossy plastic finish leave much to be desired. This nearly $80 unit seems to feel like a mere $20 device. Nevertheless, this “cheapness” is limited to the perception, though. The wires appear to be strong enough. It also helps that the AKG Q350 has the great Quincy Jones as its endorser; in the same manner other headphones have been associated with popular musicians like Dre for Beats by Dr. Dre. 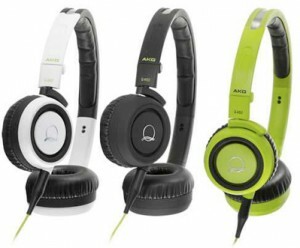 The AKG Q460 is another lime colored pair of headphones from AKG. What makes this unit stand out, aside from the color, is its good build quality and the richness of its bass levels. 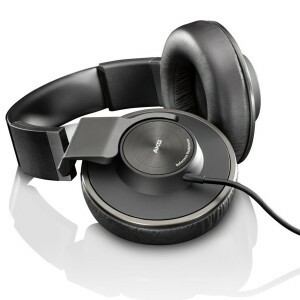 It features 40mm drivers, swiveling ear cups, a foldable design, and dual detachable cables. This is also a Quincy Jones endorsed series of AKG headphones. The AKG Q460 is marketed as a direct competitor to the likes of Fanny Wang on Ears, Monster Beats Solo, and Bose Triport headphones. It costs more than $150 and comes bundled with a 6.3mm headphone jack adaptor and long and short detachable cables also lime in color. The AKG Q460 headphones exert quite a strong pressure on the ears, even slightly stronger than that of the Fanny Wang on Ear set. However, using it is surprisingly comfortable mainly due to the ample amount and well-designed padding used on the ear cups. When it comes to sound quality, these headphones deliver something that can be described as aggressive. The mid-range tones sound like they’re very close to the ears. The bass levels are deep and powerful. Overall, the sound output does not sound so natural and is arguably uncharacteristic of something being endorsed by a Quincy Jones. It’s not a bad sound, though. 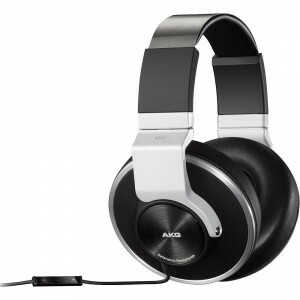 This unpretentious looking set of headphones from AKG offers a large soundstage. 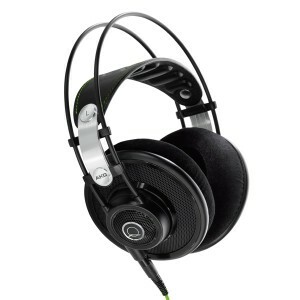 It features 50mm drivers with a 12-28,000 Hz frequency range. These are closed-back headphones that are relatively massive. The headband is massive and flat. The ear cups could even be larger than many people’s palms. It weighs 305 grams, around twice the weight of typical smartphones. If you’re using this, you are unlikely to be confident going around the city or riding on public transport with the funky looking headphones almost looking like an unusual hat on your head. Also, the cable is not removable and is somewhat too long to be used on the go. However, what you get for all the bulk and weight is a solid build and huge soundstage. The AKG K550 is also surprisingly comfortable to wear. The padding on the ear cups is great. Passive noise cancellation is also great. Additionally, sound quality can be described as spacious, making for an engaging listening experience. The price is also worth noting. At around $388.00, the AKG K550 offers good bang for the buck. It is ideal for those who are looking for headphones that offer spacious and dimensional sound comparable to what open back headphones offer. What you get with the AKG Q701 is a pair of headphones with excellent build quality, outstanding sound, and a comfortable fit. However, you will have to shell out some $420 to avail of this quite expensive unit. 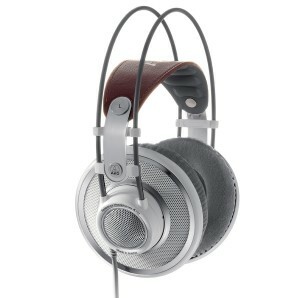 The AKG Q701 features a flat-wire voice coil technology and come with a leather headband. It is a stylish looking unit despite being made of plastic. It feels solidly built and has a build quality that is comparable to polycarbonate cans. The manufacturer claims that the unit’s arches are unbreakable. Also, the headband is self-adjusting and the ear cups are flexibly suspended. These make the Q701 really comfortable to wear, even after hours and hours of usage. Two removable cables come with the package and they are in lime and black colors, in 3-meter and 6-meter lengths respectively. The AKG Q701 features an open back design so it offers great sound dimensions and realism. Expect great sound quality from this pair of headphones. It delivers distortion-free audio and produces an impressive amount of sound details. The accuracy of produced sounds is also topnotch. This is one of the best headphones around that can adequately compete with those of other leading companies. The AKG K451 tops this list because of its great combination of price, sound quality, and comfort. At around $83, this pair of headphones offers powerful bass, excellent sound, a removable cable, as well as a good set of bundled accessories. The on-ear headphone design and 11-29,500 Hz frequency response range makes for a great listening experience. Moreover, wearing the AKG K451 wouldn’t be embarrassing. It comes with great design with the black body and silver accents. It veers away from the lime accents of other Quincy Jones endorsed headphones from AKG. The AKG K451 tightly presses into the ears without being uncomfortable, thanks for the good amount of headband tension and the adequate padding on the ear cups and headband. This means a user will likely enjoy good amount of noise isolation. Additionally, the bouncy bass sound it produces makes everything sound more vibrant and easily drowns away ambient noise. This unit is far from perfect but given the price and the quality of sound it produces, it is something that can be easily recommended to those who are getting their first great quality headphones.